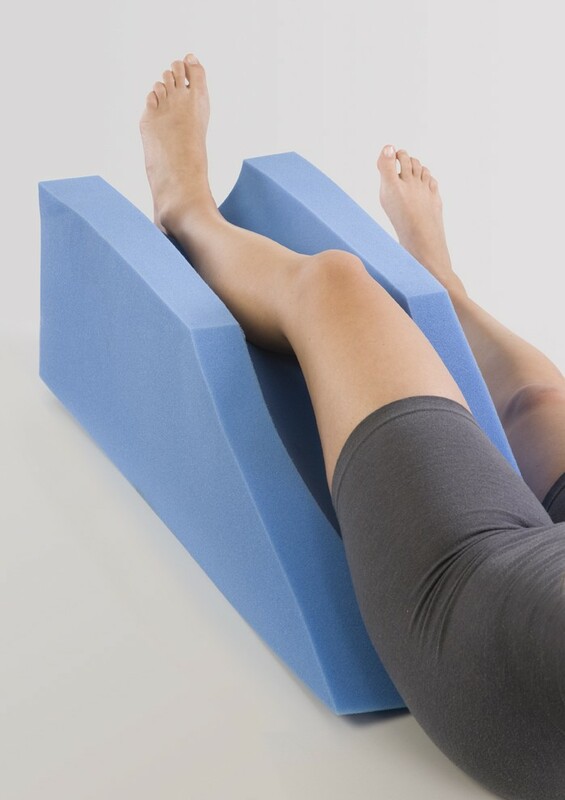 Full foam construction to elevate and maintain proper knee, ankle and lower leg position at 45° angle. Ideal for patients with leg casts, broken ankles or knees, or those requiring stable elevation to help eliminate swelling. Great for post-trauma or surgical procedures. Pillows typically flatten after a short while and does not keep the leg elevated. Pillows also do not prevent your leg from rolling to the side. The ProCare Leg Elevator is constructed of full foam to elevate and maintain proper knee and lower leg position at a 45° angle. The dense foam prevents compacting and the friction helps keep the leg elevator from sliding off the bed and helps keep your leg from sliding off. Do you make a cover for this pillow? Had bunion surgery,needed to have my foot elevated.this pillow was perfect for my recovery..i'm so happy with this, i used a pillow case for cover. Laying with leg over back of love seat worked great for ankle but was horrible for the rest of my body, especially back and neck. It was 3 months before I could sleep in my bed at all. I just has foot and ankle surgery 4 weeks ago and this time I had this product. I thought it was worth a try when I stumbled upon it on line. I came home from hospital, immediately got in my bed, placed my leg in this and have slept in my bed every night. It not only elevates your leg it cradles it and keeps it in place without putting pressure on it or feeling restrictive. I use it day and night. With a lap tray or table I am able to do art work, eat, etc. in comfort. It is summer so I also like to sit in the yard and I take this with me and put it in a chair in front of me, with this I can sit out as long as I want, don't have to go back in to elevate. I have restless legs also so even when I am healed I will probably use this because it helps keep me from thrashing around while I sleep. Perfect for my leg after knee surgery. Just right elevation. This is a great product for people who have had knee replacement. It helps with the healing. Pros: Good design. Fast service. Cons: It would be nice to have a washable case to slip this into. I like it but should come in sizes. My 6 ft. 225 lb. 82 yr old father is resting comfortably after ankle surgery, thanks in no small part to the Procare Leg Elevator (PLE). His leg, made heavier with a cast from ankle to high-shin, must stay elevated higher than his heart for three weeks. The cradling shape and stability of the PLE works wonderfully, while I can assure you a "pillow" approach, as used in the hospital, fails miserably. These PLEs should be in every orthopedic ward in every hospital in the country! This is a MUST HAVE for ankle surgery patients who must keep their ankle elevated for any appreciable length of time. Pros: "Canoe" shape is the key. Holds leg in place, while allowing a bit of a roll from side to side. Sturdy so doesn't roll over or slide. Cons: Material is a bit scratchy, and I didn't see a cover offered. Would love to have option to purchase a zippered contoured "pillow-case type" cover. I bout this because all of the pillows I use to keep my broken foot elevated are always falling all over the place. I am in the Aircast Airselect Standard boot, non-weight bearing, I have to sleep in it - I thought this would be perfect but the 2 combined do not work. The foam is too hard and gouges the hard plastic rim of the Aircast into your already struggling shrinking calf - VERY painful. Pros: I can see it would work well without the Aircast. Cons: Cannot use with an Aircast, the leg elevator foam is way too hard to use for long periods.